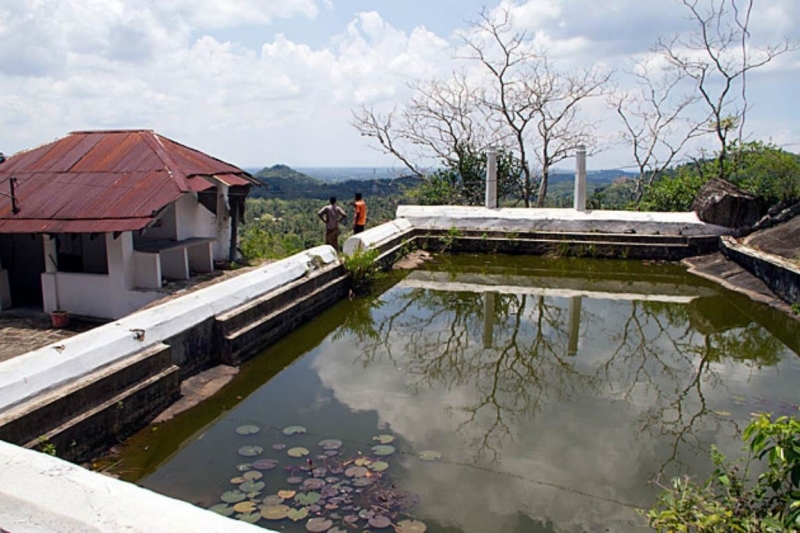 Amongst the known ancient rock temples of Sri Lanka; Mulkirigala Raja Maha Vihara (Mulkirigala Great Royal Temple) comes close behind Sigiriya in architecture and style. While not as famous as the Lion Rock; this temple is even more ancient by almost a couple of centuries. Today this temple has been recognized as an archaeological site by the government, and is a marvel of architecture, paintings and sculptures. Mulkirigala is about 2 km (1.2 miles) from the Mulkirigala junction and is reachable from either the Dikwella or Tangalle towns. The temple itself is embedded into a giant 205 m (673 ft) tall rock; and surrounded by four other rocks called Benagala, Kondagala, Bisogala and Seelawathiegala.The site is known as ‘Punchi Seegiriya’ or Little Sigiriya. Also referred to as Mulgirigala, Muvathitigala, Muhudungiri and Dakkhina Vihara in the current world; Mulkirigala has been identified to be the temple known as Giriba Vihara in the ancient religious chronicle Bodhi Vamsa. Through this it has now been know that Mulkirigala is a temple where one of the 32 seedlings germinated from the original Jaya Sri Maha Bodhi (the holy bo tree branch that was brought by Sangamitta and planted in Sri Lanka, when she introduced Buddhism to the country) was planted. Mahavamsa, another religious chronicle states that the Mulkirigala Temple was built in the 3rd century AD by the King Saddhatissa. The temple continued to receive royal patronage and was renovated by many of the following kings. During the 461-479 AD time period a stupa was added to the temple by King Datusena; and it was further developed by King Kirti Sri Rajasinghe who reigned during the mid 18th century. During the 18th century, under the reign of the Dutch, the Mulkirigala rock attained fame as ‘Adam’s Berg’. The Dutch believed that tombs of Adam and Eve were located here. This area comprises of the museum, lower temple and the rest house. This includes of the Royal Temple, Tombs, Seemamalakaya, Monastery and Paduma Rahath temple. Paduma Rahath Vihara contains the largest reclining Buddha image of the entire temple. There is also a small painted pagoda found inside a cave and a modern information centre built on a terrace. 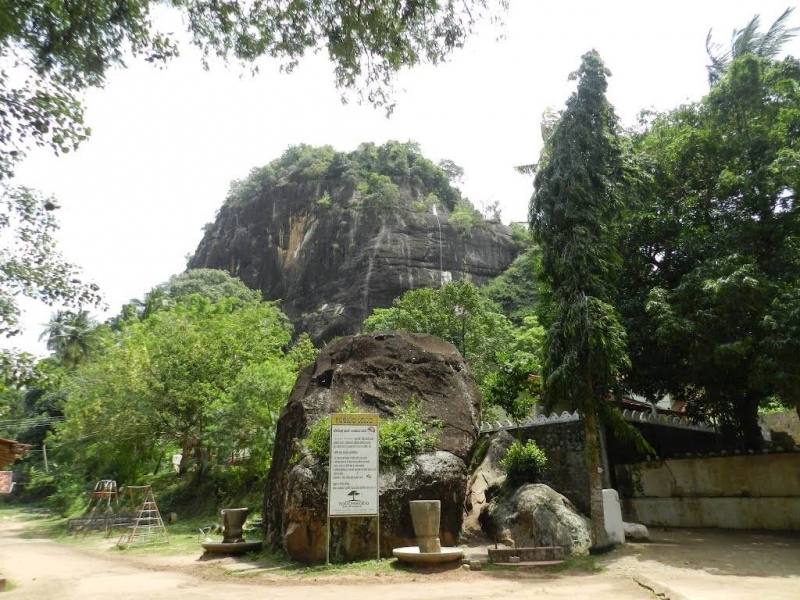 The Bomaluwa is an area with the Vesak hall compound, the Majjhima Nikaya cave (Bhanaka cave), the Viharagal rock inscription (between 1400 – 1500 years old), and the Bomaluwa (Bo tree Terrace). Dethispala bo tree, attendant bo tree, Garandi Kapolla, stupa, bell tower, pond and horizon valley can be seen in upper vihara compound. Dethispala bo tree is believed to the original sapling from the Jaya Sri Great Bo tree. 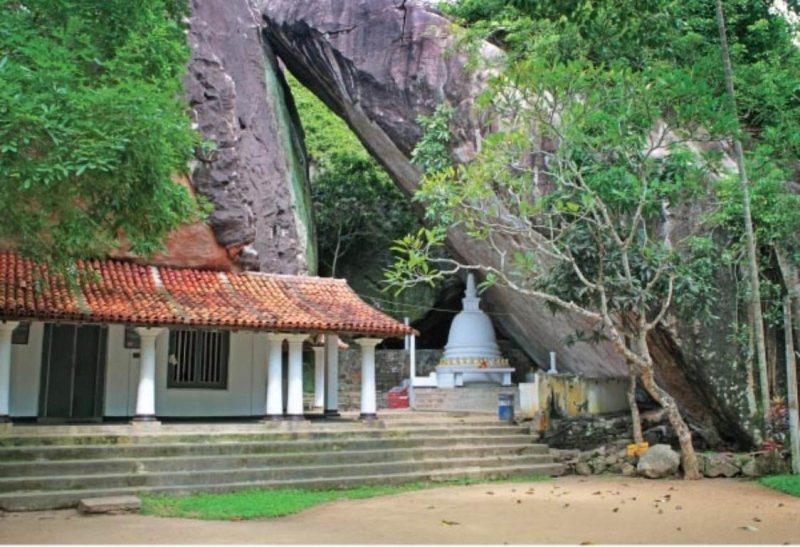 A large collection of murals and sculptures belonging to the Kandyan Era can be seen in the caves, and image houses in the temple premises. Most paintings depict the episodes from the life of the Gautama Buddha and Jataka stories, such as Vessantara, Telapatta and Shivi.